We hate to sound like we are repeating ourselves, but week by week you should be needing this article less and less. Any players in excess of 300k, you should look to make cash out of whenever you can. You can always improve your team. The only rookie that may actually make the final team is Tim Kelly, but even he can’t be trusted week to week. Unfortunately he’s not going to have 70 point last quarters every week. As for the other players, the only questions should really be which one to play over the other. There is bound to be a few curveballs that occur at selection this week, and this will be on top of the known omission of Fyfe, and the likely omission of Heeney. We are happy to answer any questions you have on Twitter – @TheMilkmenDT. We do apologise to the poor soul that we recommended to play Cunico over Kelly! Our plan going forward, to help out as much as we can, is to go through players who are still relatively cheap who you may think about bringing in. The reality is this list will get smaller and smaller as only players who have played limited games will be on the list. We’ll keep looking at players coming through so there’s at least some educated guesses when you are filling your final bench spots. Sier or Narkle? If you can’t have both, we recommend going with Sier. 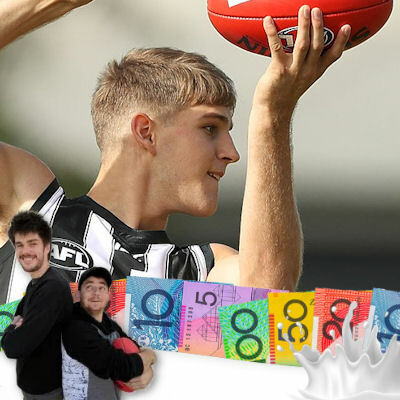 Brayden Sier ($201,000 MID BE -10) – So who saw this one coming when Treloar went down? The talk was of Adams increasing his output, De Goey increasing his output, but nothing about Sier. Played an inside mid role and loved the responsibility against a weakened midfield. Had 19 touches and six tackles for his 82 points. Quinton Narkle ($204,000 MID BE -14) – Whoever takes care of the kids down at Geelong really needs a public mention at some point. The ability for these players like Narkle to debut and have an immediate impact is incredible. He looked very exciting out there and got the majority of his 14 possessions in the forward half. Having said this, he still managed to travel all the way down to the defensive 50 at times to help him get to 88 points. For the record, we would choose Sier over Narkle for job security. Keep in mind that Cockatoo, Crameri, Menzel, McCarthy and Gregson are all close to a return. They also all happen to play similar positions. Jacob Dawson ($196,000 MID BE 2) – The man whose job it was to play on Tom Mitchell in his first quarter of football for the club was far more relaxed in his second game. Not as much responsibility this week in terms of a direct opponent and lapped it up with his 17 touches, one goal and 64 points. We actually really like Dawson and the way he goes about it. A great option for any team who needs him. Harrison Petty ($206,000 DEF BE 23) – Look, he did his job but not one for us. Would almost rather make some cash and get someone who we dont need to be our D8. Darragh Joyce ($173,000 DEF BE 22) – Kind of came in and kept the spent warm for Webster who is due back this week. Had 10 touches but minimal impact and only ended up on 32 points. Brad Lynch ($191,000 DEF BE 4) – With the Dogs starting to get some of their artillery back it was pleasing to see Lynch still named. Only averaging 52 points at VFL Level going in to his debut but his 18 touches at AFL level suggested a different level of output is possible. Had 63 points the first time round and is the bet option out of this bunch of defender rookies we are talking about. Harley Bennell ($249,000 FWD) – We have written his name in this section before. He is close to a return (assuming there isn’t an incident). Everyone knows his story and what he CAN do. He is a very awkward price if he is named as well. He had 21 touches, kicked a goal and finished on 75 points. He was taken off at three quarter time so it was pretty solid scoring. Aaron Francis ($259,000 DEF/FWD) – He is building into some good form in the VFL. Similar to Bennell, he is probably just too expensive for this time of year. He is averaging 17 touches and 74 points in the VFL. Ryan Abbott ($170,000 RUK) – Abbott is a big consistent ruckman. His form has been very solid in the VFL and given that Geelong can’t make up their mind who is their number one ruck, they may just give him a run. Averaging 90 in the VFL. Sam Simpson ($236,000 FWD) – Averaging 19 touches and 78 points in the VFL. His form has been solid but you would think he is behind quite a few players. Fergus Greene ($170,000 FWD) – He is going ok. Not a massive scorer, but a chance to come in. Averaging 11 touches and 59 points in the VFL. Callum Porter ($170,000 MID) – Similar to Fergus Greene. He is likely to get a game sometime soon. Lin Jong’s injury helps. Not a massive scorer though. Averaging 13 touches and 59 points. Oskar Baker ($176,000 FWD) – Melbourne may look to swing the axe coming off another disappointing performance. Baker may cash in on this as he had 34 touches and 126 in the VFL on the weekend. Baker is averaging 19 touches and 73 points. Thanks for the write-up, Milkos. Agree that Sier is probably a priority to bring in over Narkle. All those Cats getting ready to return … not to mention Scooter, who’s not on their injury list and I read earlier this week that Chris Scott said he’ll definitely be back! Hard to gauge how the structure will work out for Narkle. He certainly made an exciting debut though! Agree with everything you said. Forgot to mention Scooter but he is another one who adds to their depth. Reliable forward premiums are hard to come by and Menegola has too much risk we feel. I didnt get to see any of the saints game on the weekend – Rice had been pretty good for me but went and chunked out a 26! Did he have a role change, get injured or just go full spud? Also have both Fyfe and Heeney this week – thinking fyfe has to go, but tossing up holding/folding isaac. Any thoughts? Last few weeks have brought in McLean/Treloar/Fyfe all the week they got injured so will be sure to tell you who i bring in so you can avoid them! I have Heeney, Fyfe and Rice. mids – Sier or A Brayshaw (Freo)?? fwd – Spargo (if named – think will be), Dow or Ahern? ?